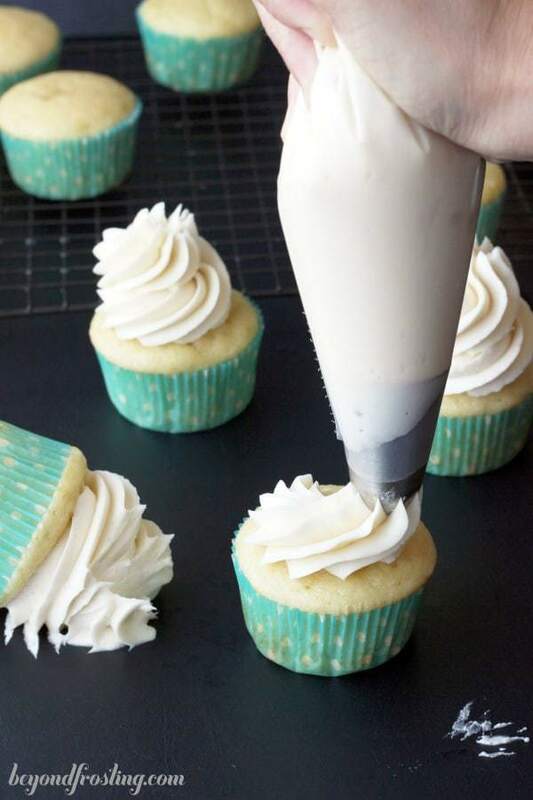 This Perfect Vanilla Frosting Recipe recipe is very versatile. It’s a basic vanilla buttercream using butter and powdered sugar. 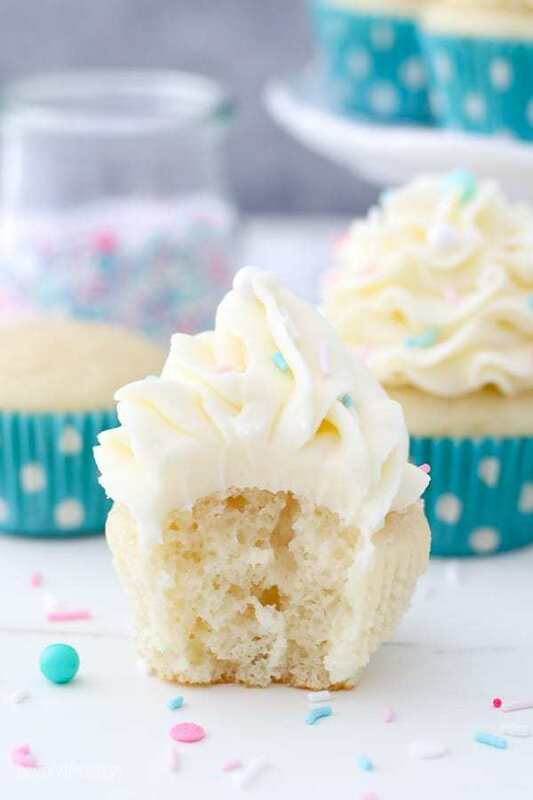 The big difference in this recipe is that is starts with cold butter and it whipped which makes this the perfect frosting for piping cupcakes and cake decorating. Today’s post is all about going back to the basics. 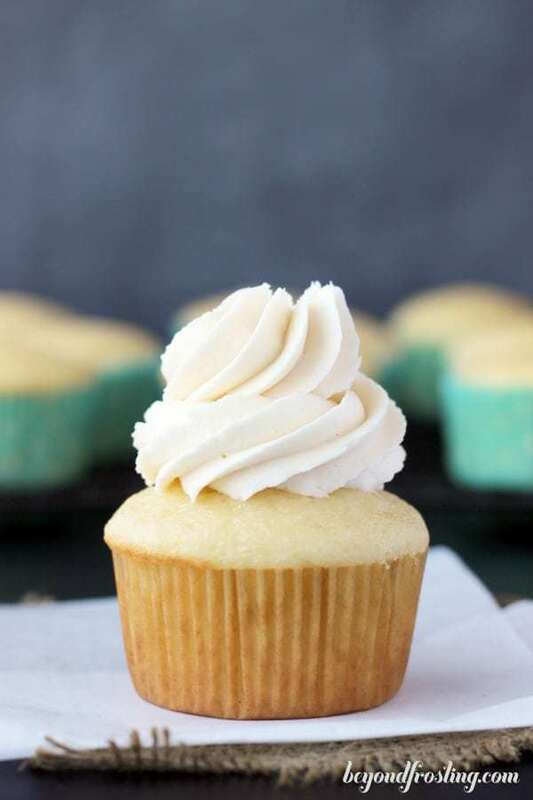 This is the perfect vanilla frosting (or buttercream recipe) and can be used as a base for many different types of frostings recipes. 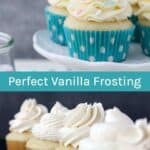 While I have over 30 awesome frosting recipes, there’s nothing better than a Perfect Vanilla Frosting Recipe. I’ve used this recipe as a base for dozens and dozens of cakes, cupcakes and cookies you’ll find on my blog. It is true that vanilla frosting is the most versatile frosting there is. 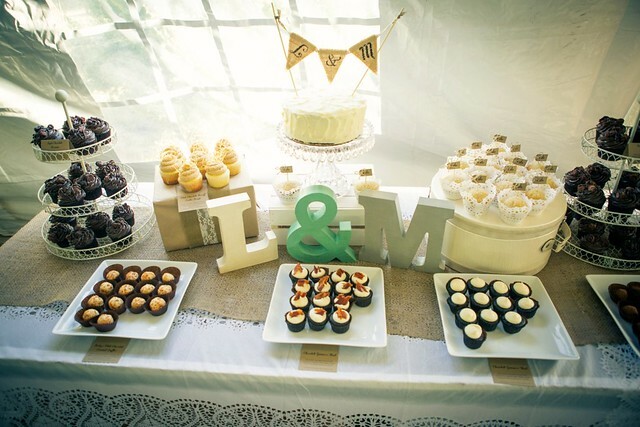 It can be paired with moist vanilla cupcakes or chocolate cupcakes, lemon or strawberry or perhaps even red velvet or carrot cake. 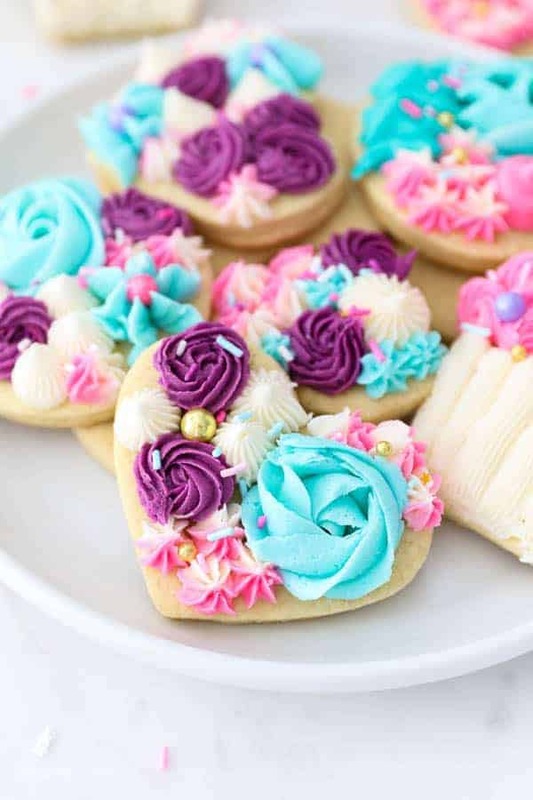 You can use a vanilla frosting as a base to add your favorite candy or sugar cookie or fruit. 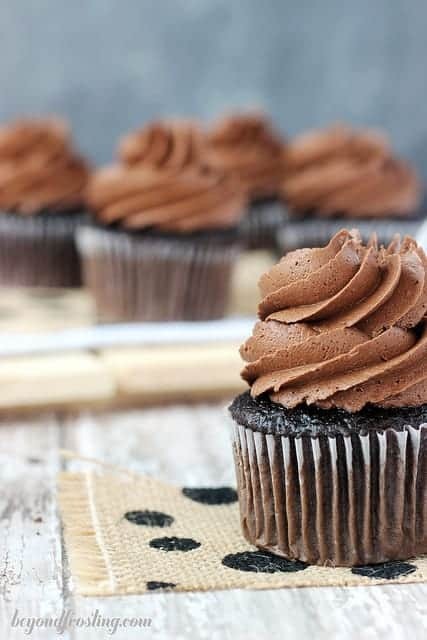 Now if vanilla isn’t your thing, I’ve also got a recipes for chocolate frosting. 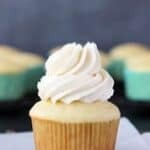 When it come to vanilla frosting recipes, there are two different kinds that most people tend to use: American Buttercream and Swiss Meringue Buttercream. 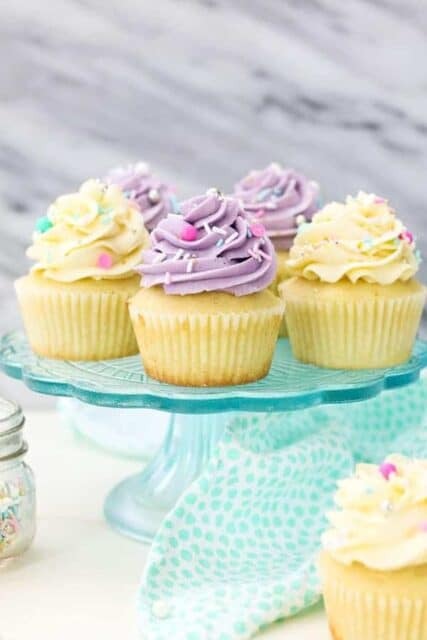 The difference between a Swiss Meringue Buttercream and an American buttercream is that American buttercream is made with powdered sugar and butter or Crisco. Swiss Meringue Buttercream is made with whipped egg whites, granulated sugar and butter. 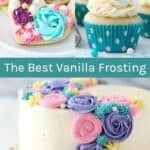 There are many different vanilla frosting recipes. Some use vanilla extract and some use vanilla beans or vanilla bean paste. Vanilla beans have a wonderful flavor but can be expensive or difficult to find. Either way, just make sure you’re using pure vanilla extract, not imitation. Some versions use half butter and half Crisco. Crisco in a frosting might sound unusual to some, but it has its benefits. 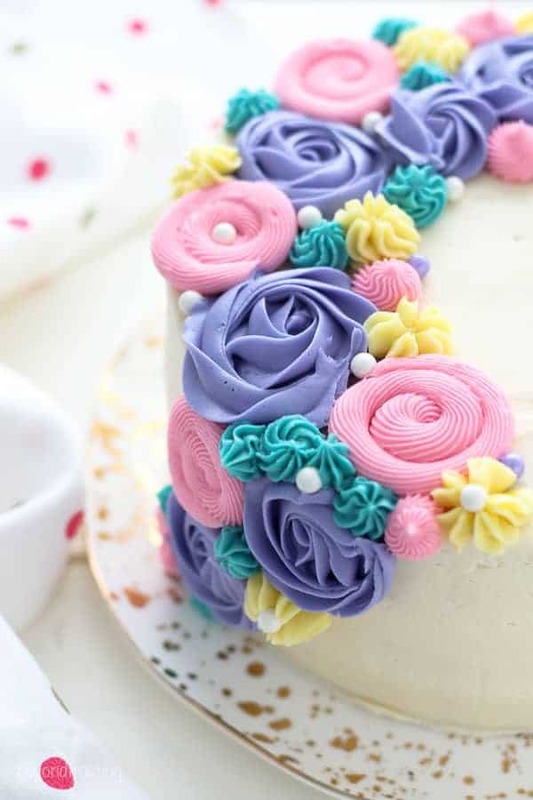 It’s often referred to as a decorators buttercream because it more stable and easier for piping different shapes. This is the method I learned when I took the Wilton Decorating classes. 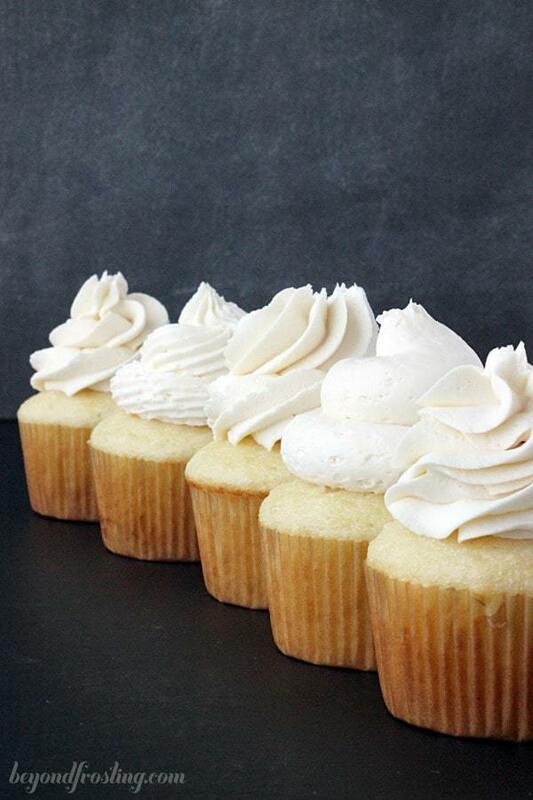 My perfect vanilla buttercream is whipped buttercream. When it comes to frosting, I live by the WHIP IT rule. The longer you whip it, the better it will be. When a problem comes along, you must whip it. You get the point, right? I start with COLD butter. Yes, cold. Most frosting recipes (including many of mine) call for softened butter or butter at room temperature. The difference between starting with cold butter versus softened is that the cold butter requires you to whip it longer in the beginning. I believe the cold butter produces a more stiff frosting that is better for piping. If your butter is TOO soft, then your frosting will be “weaker”. I HIGHLY suggest that you use unsalted butter for your frosting. It allows you to control the flavor. The not-so-secret ingredient to a creamy, velvety frosting is heavy whipping cream. It’s an ingredient that usually doesn’t come cheap, but it is makes the difference. 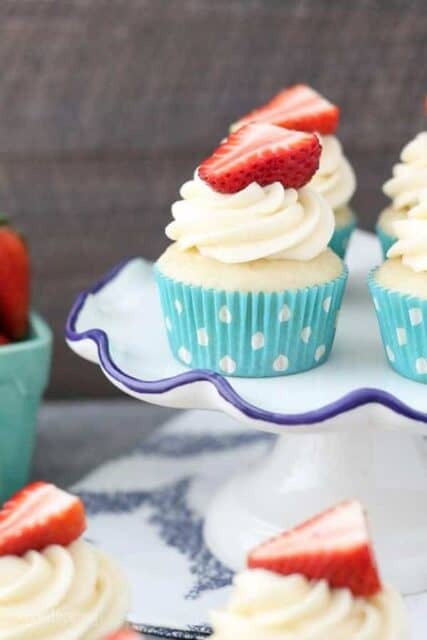 Sure, you can substitute with milk instead but using the heavy whipping cream will help give you those extra air bubbles in the frosting once it’s whipped. The rule of thumb for this vanilla frosting is that you should use 2 cups of powdered sugar for every stick of butter (1/2 cup). You can always make the frosting more stiff by adding more powdered sugar. You can also add additional heavy cream to offset the sweetness and make it softer. The last thing you can do it cut the sweetness is to add a pinch of salt, but adding little by little is key. Too much salt cannot be fixed. This frosting recipe makes enough for at least 24 cupcakes that have a hefty amount of frosting. The second rule I live by when it comes to frosting, is never come up short. So I usually end up with more than enough frosting. 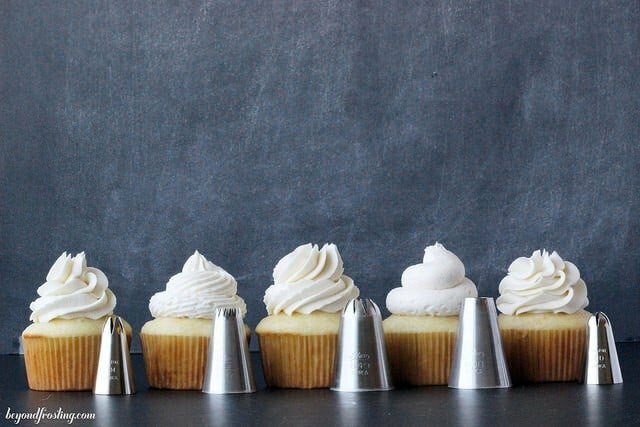 If you are only frosting 12 cupcakes, you can halve this recipe. This recipe can be made in advance and kept at room temperature for 24 hours prior to frosting. Otherwise it can be stored in the fridge for up to 7 days before serving. Any longer than that and I would recommend freezing it. You will need to allow it to soften for a couple of hours before using it after it’s been in the fridge. I might also recommend re-whipping it after it has come back to room temperature. I prefer to make all my frosting recipes fresh, so I can’t speak too much to the freezing of the frosting. Do my cupcakes needs to be refrigerated? How do you make light, fluffy or whipped buttercream frosting? The key to making fluffy buttercream is by whipping your frosting, a lot! I think fluffy buttercream is best produced when you start with cold butter. As mentioned above, cold butter allows you to control the consistency of your frosting. 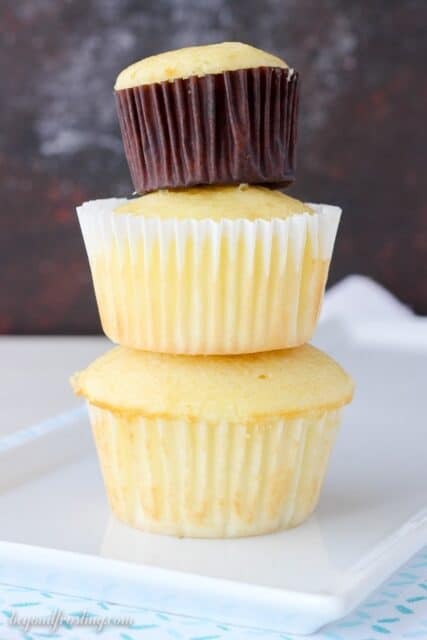 Think about it, if you start with softened butter, it will take more powdered sugar to get a stiffer frosting, but if you start with cold butter, then you have more control over how long you can whip the buttercream. Be sure to whip your butter for a good 3-5 minutes before adding any liquid or powdered sugar. The butter will grow in volume and look very light in color. Then you’ll whip the buttercream for 1-2 minutes at a time after adding each cup of powdered sugar and again at the end for a couple of minutes. If you feel the frosting is too thin, you can add additional powdered sugar. Do I have to use heavy cream or can I use milk? Milk can be substituted for heavy whipped cream if needed. 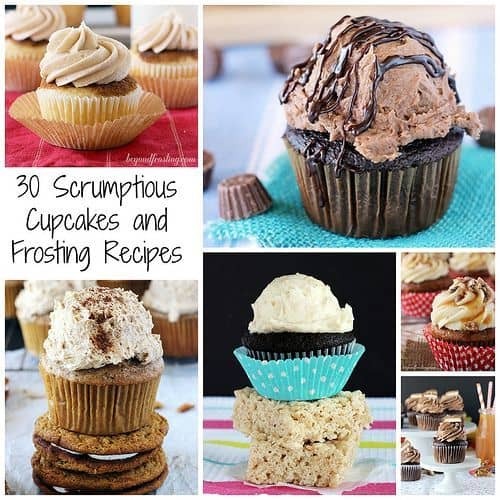 How do I make buttercream frosting? I get so many questions and I find I am often answering the same questions. 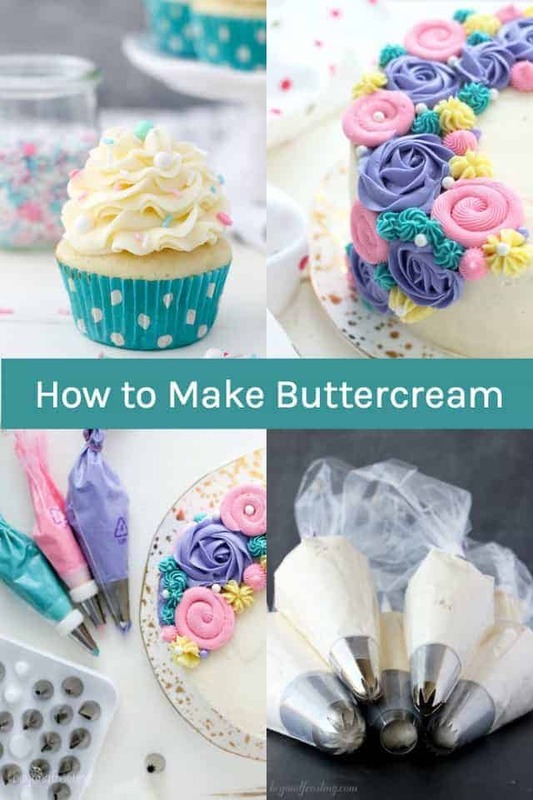 Do I have rounded up all the most popular questions and puts lots of details into answer all your questions about how to make buttercream frosting. So be sure you spend some time reading through there if you are looking for the answers to questions like, how do I make stiff buttercream? What’s the best frosting for cupcakes? How much frosting do I need for 12 cupcakes? I talk all about it in that post! If you’ve ever wondered what my secret is to piping perfectly beautiful cupcakes, I’ve got you covered. I’m telling you all about my favorite tools and tricks for decorating the perfect cupcake, and there’s a bonus video included! This is a post you’ll come back to time and time again. 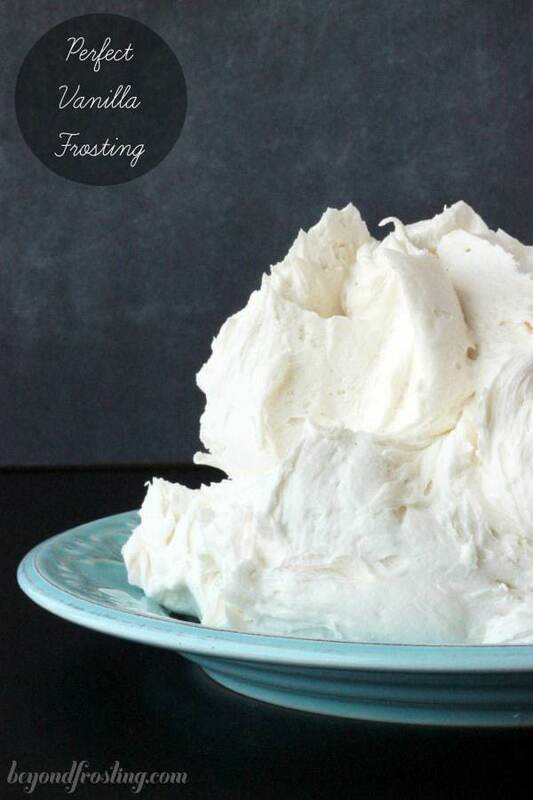 This Perfect Vanilla Frosting Recipe recipe is very versatile. It’s a basic vanilla buttercream using butter and powdered sugar. 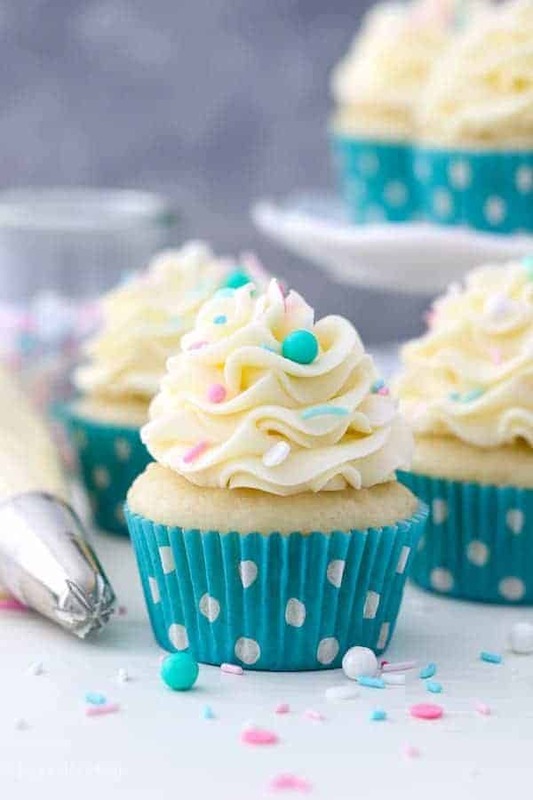 This is the perfect frosting for piping cupcakes and cake decorating. 1 1/2 C (3 sticks) Unsalted butter, cold. How can I counteract some of the sweetness instead of salt? Also can I use almond extract instead of vanilla? Hello- Can i substitute heavi wipoed cream for half and half? Hi Katie, yes that will work or milk will work as well! Hi – Can I substitute water for the dairy? My mom is lactose intolerant and I’m having trouble finding a good piping recipe! Hi Kerry, Lactose free milk might be a better option. I am sure water would work but it is thinner than heavy cream, so maybe you need to reduce the amount of milk?